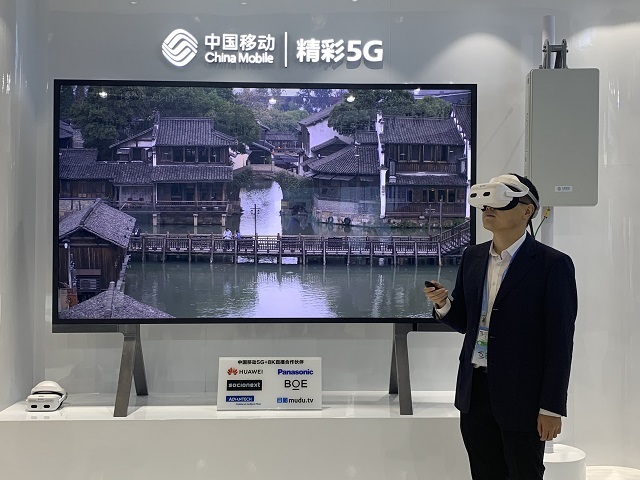 At the fifth World Internet Conference in Wuzhen, Zhejiang province, China Mobile 5G Innovation Center worked closely with Huawei to unveil what the pair say is the first 5G network based 8K VR live broadcast. Compared with technically mature 4K VR live broadcast (requiring 50–80 Mbps data rate), 8K VR services require a higher data rate (100–160 Mbps) and wider bandwidth. The faster network speed and increased display resolution will allow users to benefit from a more detailed, true-to-life, and immersive experience. The 8K VR live broadcast was provided courtesy of a 5G network instituted by Zhejiang Mobile, which comprises Huawei developed 5G C-band sites and the core network. As a result of the favourable uplink and downlink transmission conditions (bandwidth over 100 MHz) in the 5G network, the 8K VR 360° camera captured picturesque South Lake views and then uploaded the compiled videos for cloud rendering in real time. The scenery videos were then downloaded at an ultra-high 5G speed to VR headsets. VR broadcast is expected to rise as a new type of 5G application, as well as the most important service under the eMBB umbrella. 8K VR live broadcast is set to be widely adopted throughout the industry. Users can not only enjoy scenic spots, concerts, and sports events without stepping out of their own homes, but also gain access to gaming, entertainment videos, healthcare, real estate, retail, distance learning, engineering, and a whole host of other new services. The 8K display effect is the key to offering virtualised reality to all users, and the advanced display technology requires an ultra-high transmission data rate enabled by 5G. The 5G network utilised in the demonstration deploys Huawei C-band base stations. Thanks to scenario-specific smart beams and 3D beamforming, Huawei 5G C-band AAUs boast flexible and precise cell coverage control and can deliver Gbps-level ultimate user experience. Dozens of base stations were deployed by Zhejiang Mobile and Huawei. In addition, China Mobile and Huawei jointly verified multiple 5G key solutions in terms of cell throughput, single-user peak data rate, and user experienced data rate. These two companies also took the opportunity to launch three 5G innovative services with 100 Mbps data rate: 5G 8K VR live broadcast, 8K live broadcast, and in-ambulance telemedicine. This is the debut of these services in the industry. China Mobile 5G Innovation Center will continue in cooperation with industry partners, jointly working on the exploration and innovation on 5G applications, push forward 5G ecosystem to be matured and 5G application to be launched commercially.